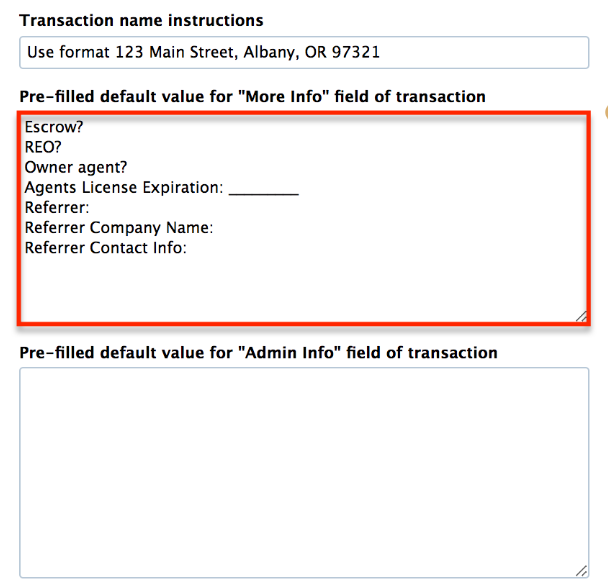 You may specify company-wide default/placeholder information to be automatically inserted into the More Info field of all new transactions. Short version: 1) Click your name in the upper right corner then "Admin / Settings." 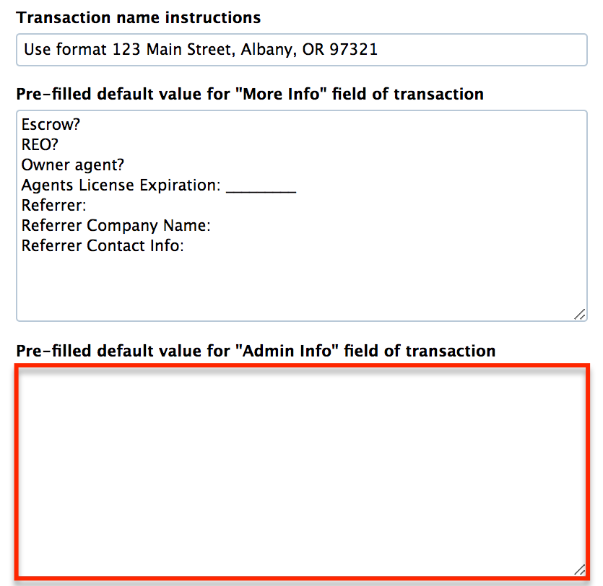 2) Scroll down to the “More Info" field and type in the information to be automatically shown in the More Info field when creating transactions. 3) Click [Save Settings] to finish. Scroll down to the “More Info" field and type in the information you’d like to be automatically added to all new transactions. This feature is ideal for tagging information not covered by other fields and can remind users to add the additional information there. Click [Save Settings]. Now, whenever a new transaction is created, the text you entered will be added to the ‘More Info’ field. Scroll down to the “Admin Info" field and type in the information you’d like to be automatically added to all new transactions. This feature is ideal for tagging information not covered by other fields and can remind users to add the additional information there. Click [Save Settings]. Now, whenever a new transaction is created, the text you entered will be added to the ‘Admin Info’ field.